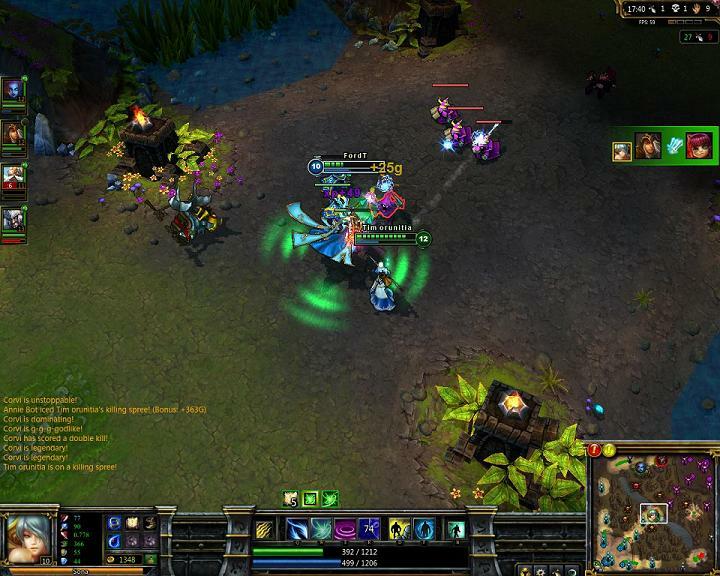 League of Legends is a free online multi-player RTS (real-time strategy). Player are formed into two teams, either a 3v3 or 5v5 depending on the map. You control 1 of (currently as of August 2011) 81 champions and each champion is different in their own way. Different spells, different attributes, different strengths, each champion can contribute to the team in their own way. This makes the variations of a team numerous and will ensure you will encounter something new every game as no two players are ever the same. All champions level up throughout each game, starting at 1 (obviously) and maxing to 18, at every level you can improve a spell making it stronger and more effective. To gain experience to level up you have to go about killing minions and champions. Games can last from 20min to an average of 45min. Since this is online there are patches coming out all the time updating the game; bringing new characters, items and soon a new map and game type. As stated before you are in teams of 3 or 5 and teamwork is essential if you want to win, and should you ever have to fight missing a person it gets even more… challenging. The objective is simple, you and the enemy team have a “Nexus” at your base, you must destroy the enemy Nexus before they destroy yours. However, there are obstacles in the way. There are lanes and in these lanes are towers, you must destroy all the towers in at least one lane before you can reach the enemy Nexus. In each lane before the towers that guard the Nexus there are inhibitors, at least one of these must be destroyed as well. In between the lanes there is the jungle, where creatures lives which you can go kill. 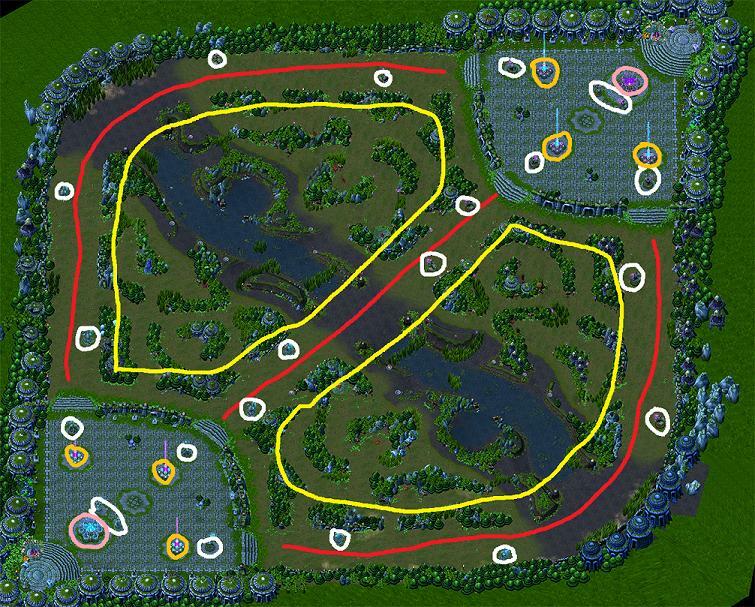 Here is a map of the 5v5. In red are the lanes, yellow outlines the jungle. White circles show the towers, orange circles indicate the inhibitors and finally the pink circle show the Nexus which you will be defending/attacking. Don’t worry, you don’t have to do all this by your team. Every 30 sec a wave of minions spawn from your Nexus and travel along the lanes assisting you and once every three waves a larger minion spawns. Killing the enemy minions will result in some gold given to you which you can spend on items to buff up your character in many ways. Gold can be earned either by killing minions/champions/creatures in the jungle or by destroying the towers. Destroying the towers will result in everyone in your team earning gold. Now that the rules and the formal stuff is over I can talk about how the game is. It is great! It ensures you have to work as a team to win while also giving you a complete hatred for the enemy champions and a great deal of satisfaction whenever you kill one. If you do not like playing against other people or find it a bit hard then don’t worry. League of Legends offer AI bots to play against, with variable difficulty which is great to practice or see who you like to play. The graphics are not advanced so it doesn’t look realistic but it does look fantastic. It takes comic book appearance, using bright, vibrant colours to entertain the player. I would like to point out. This game IS completely. And I mean COMPLETELY free. And as Sam says it IS faaaantastic. So really giving it a shot is really a no brainer and I would heartily recommend you give it a shot as soon as you can! I will say though, that while playing against the bots can be a challenge on it’s own, eventually you will have to play against other players if you truly want to play LoL. Because it is first and foremost (and always will be) a team-based PvP multiplayer. Also I would like to welcome Sam here as a new contributor to MMGaming! The game it’s self is fantastic and for the not too shabby price of nothing what more could you want? Just don’t forget to mention that the online community is full of griefers who don’t tolerate noobs well and will use the chat function to cry and moan constantly whilst blaming everyone but themselves. They can’t admit when the opposing team is good instead it’s always “FFS noob team is why we lost” or “Tryn is sooo OP thats why we lost”. Only play lol if you’re willing to put up with this kind of childish abuse almost constantly.